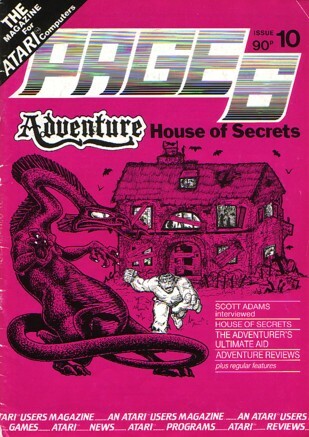 It may have been Will Crowther and Don Woods who wrote the very first Adventure (see last issue's Adventure Column), but it was Scott Adams who made Adventures available to the masses. His name is synonymous with Adventures and there are very few computer owners who haven't heard of him. Adams was first introduced to Original Adventure by his fellow employees while working as a systems programmer for Stromberg Carlson. For almost ten days, he went to work early and stayed late. He told his wife that he was working on a heavy project, when in fact he was playing Adventure. When he'd achieved the title of Grand Master, he became intrigued with the idea of getting some sort of Adventure into his own computer – a 16k TRS-80. When he mentioned this to his friends, they laughed! After all, the original FORTRAN version took 300k! Fortunately, Adams was not daunted by their laughter and hit on the idea of an Adventure interpreter (just as BASIC is an interpreter). After some weeks, he had developed a working interpreter written in BASIC together with a skeleton Adventure to play on it. After a further six months of play testing, he had finished his first Adventure. It was called Adventureland and was released through The Software Exchange (who started SoftSide magazine) and Creative Computing Software. This early BASIC program makes interesting study for the serious Adventurer and can be seen in SoftSide July 1980 or "The Captain 80 Book of BASIC Adventures". During the six months of programming, Adams' wife Alexis felt that she was becoming a 'computer widow', so she started hiding his diskettes around the house in order to get his attention. At one time, she hid the only copies of Adventureland in the oven. That got his attention all right! Adams decided that one Adventure was enough and he gave the game away. A short time later (this was in 1978), Alexis unexpectedly announced that she would like to write an Adventure. This resulted in a second program called Pirate's Adventure. Again it was written in BASIC and has since appeared in Byte December 1980. The Adventures proved to be extremely popular, so Adams started on a third one. When halfway through it, he was prompted by Lance Micklus to convert to machine language because of its added speed. He followed this advice and has never looked back. There is a tendency for the earlier Adventures (up to number 5) to be relatively easy and the later ones to increase in difficulty. You will gain the maximum enjoyment from the series by playing them roughly in numerical order. For anyone new to Adventures, Pirate Adventure or Voodoo Castle are ideal. These are fairly easy and a hell of a lot of fun! At the opposite end of the scale is Savage Island, which is a real brain teaser! Adventureland appears to be the most popular in the series and is therefore the most appropriate to review. Unfortunately, its popularity is not because it is the easiest or the best, but simply because it is number one in the series. As Adams' first Adventure, it is lacking in some areas that the following Adventures were not. For example, the theme of Adventureland is not a particularly strong one. It is a mixture of fantasy situations and the influence of Original Adventure is very obvious. The object of the game is to find thirteen treasures and return them to the proper place – although you won't know where the 'proper place' is until you find it some way into the game. You are given points for each treasure returned, so that you can always see how you're going by typing SCORE. Your Adventure begins in a forest. If you climb a tree, you'll see a meadow and a lake to the east. Obviously that's the way to head, so you climb down the tree and head east. Lo and behold! A sleeping dragon! And a sign which reads "In many cases mud is good. In others...". What on earth could that mean? Here lies the magical appeal of the Scott Adams Adventures. We are only in the third location and already we are intrigued by his puzzles. As it happens, waking the dragon is one of the hardest problems of the game. Let's examine it to gain an insight into Adams' cunning mind. Firstly, there is no evidence that you need to wake the dragon at all, but it's too tempting to ignore and Adams knows it! So you try waking, hitting, kicking, climbing on, pushing, pulling, etc., but all to no avail. You eventually give up and move on to other tasks, but the sleeping dragon sticks in your mind. As the Adventure develops and you find useful objects, you are constantly drawn back to the sleeping dragon to test new ideas. And some of them work! The first method of waking the dragon will probably get you killed. (Remember the sign?) The second requires you to be very innovative. The results are quite humorous, but this time the dragon gets killed. By now you will probably be thinking that the dragon is a red herring, but that's where you're wrong. There is a third way of waking it, which you won't discover until deep into the game. The third way kills neither you nor the dragon and reveals a treasure to boot! Discovering it gives you a great sense of satisfaction and triumph, because you know you had to work hard to get it. Adventureland is full of puzzles like the one above. Adams shows a deep understanding of the human mind (whether he realises it or not) and exploits it to the fullest by constantly tempting your curiosity and testing your powers of reasoning. You will become entranced by the puzzles and lose all track of time. What seems like half an hour could be half a day – or night. You can also expect to get killed a few times, but if you carefully map everything, you'll find a way to reincarnation. Failing that, there is a SAVE GAME feature, but it only allows one version to be saved unless you use a separate disk or cassette for each version. Adventureland uses elements from The Arabian Nights and the legend of Paul Bunyon. The latter is a North American folk hero who neither Australians nor Europeans may be familiar with and a couple of minor clues may go over their heads as a result. Adventureland also uses a lot of magic, so keep this in mind. Hints to help overcome all the major puzzles are provided within the Adventure itself, but if you get stuck, there are several sources you can turn to. Firstly, try typing HELP in each room. This can occasionally be VERY informative. Secondly, buy the Scott Adams 'Book of Hints'. Thirdly, use the hints at the end of this issue's column. In summary, Adventureland's theme is inconsistent, but this is more than compensated for by the absorbing puzzles. Recommended for intermediate Adventurers. I have taken great pains to ensure that the Adventureland hints are different to those in Scott Adams' own 'Book of Hints', although I've again used his coding technique. Simply look through the clues until you recognise the area where you're stuck, then decode the hint by matching the numbers with the words in the attached list. As there would be a lot of beginners stuck in Adventureland, the hints are more straightforward than those for Original Adventure in the last issue. Have fun! Can't catch the golden fish? Can't get the statue out of the quicksand bog? Can't get yourself out of the quicksand bog? Chigger bites getting you down? Can't return to life after being killed? Locked door barring your way? Can't unbrick the bricked up window? Does the bear stop you from getting the magic mirror? Does the magic mirror shatter when you drop it? Can't get the treasure from the lava? Can't return from the maze of pits? Can't get the royal honey?